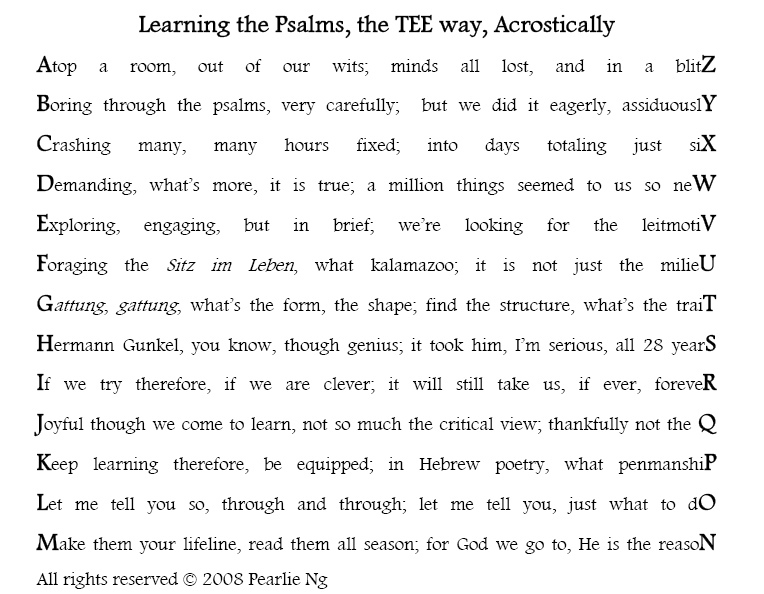 Before I talk about learning the Psalms, there is a need for a bereavement psalm. My aunt passed away this morning. She was suffering from cancer, which was just diagnosed not too long ago. My aunt was the spiritual pillar of strength of our family, and no doubt she is also one of the spiritual pillars of the church. During the wake service this evening, the appropriate words to send her off was 2 Timothy 4:7-8: for indeed she has fought a good fight and have finished the race. She had kept an astounding faith. She is now with God. Sorry to hear about your Aunt. You will all miss her, I'm sure. Your acrostic, I thought, was very good! Sorry to hear about your Aunt, Pearlie. take care. Thanks all for your kind words. I appreciate you all.